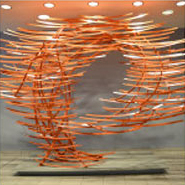 NEW YORK – “Outside Time,” a new, monumental sculpture by artist Dimitar Lukanov, will be formally unveiled on February 26, 2014 in the Departure Hall at New York’s JFK Airport Terminal 4. 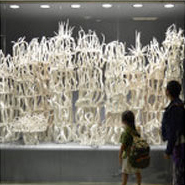 The sculpture is the signature piece of a three-work sculpture project commissioned to Dimitar Lukanov by JFKIAT LLC in 2012 as part of the major redevelopment that Terminal 4 is undergoing to accommodate 15 million passengers. The massive sculpture – a structural wonder of weight distribution – is an elated, optimistic “Goodbye” to the millions of departing New York air travelers. “Outside Time” is a veritable drawing in space, a breathless, effortless, instantaneous gesture in the air. The piece aspires to halt, even momentarily, the relentlessness of time, to indeed be Outside Time.” says Dimitar Lukanov. “I do transparent sculptures that converse with nature. The bronze and iron used in my work long for permanence, but the forms and illusions are ephemeral. 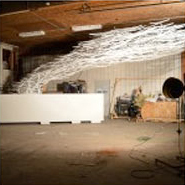 The end result of my sculpture is an abbreviated script of matter dissolved within the air”. With a 30 ft. long span, the 4600-pound structure (15 ft. tall and 11 ft. wide) is comprised by 1,000 feet of steel and aluminum tubing and 600 steel and aluminum elements. 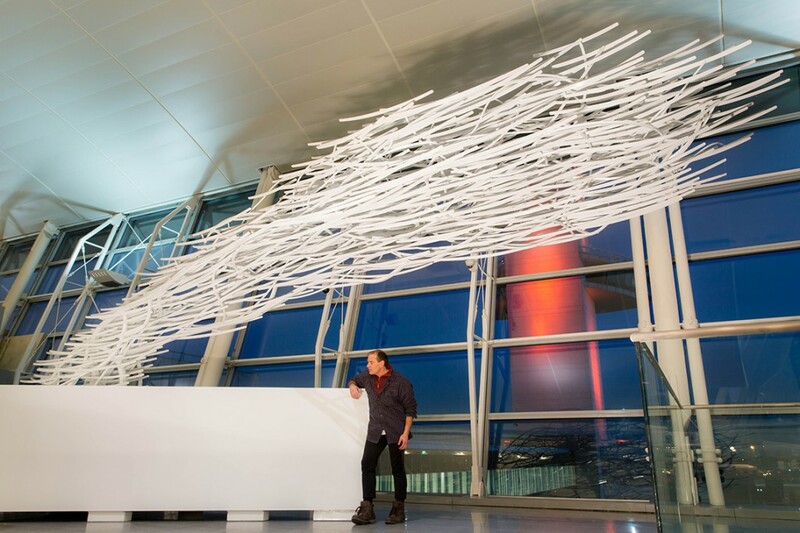 With 90% of the piece being airborne, the sculpture is a structural and design feat. No computer programs were used to map out the design development of “Outside Time” as Dimitar Lukanov built the piece to scale-by-eye over an eight-month period. The sculpture originates from a hollow triangular base to counterbalance its weight and asserts itself in the air by expanding space. For Lukanov, this was an epic endeavor pushing the limit of possible/impossible in the realm of both creative and logistical expertise. JFKIAT LLC manages Terminal 4 at John F. Kennedy International Airport and is the first private, non-airline company to be selected by the Port Authority of NY & NJ to operate a terminal at JFK. Terminal 4 is one of the largest air terminals in the New York area, serving 30 international and domestic airlines with an annual passenger volume of nearly 11 million travelers in 2012. With a major expansion currently underway to make Terminal 4 the new home of Delta Air Lines at JFK Airport, the 1.5-million-squarefoot Terminal 4 will increase in size to nearly two million square feet and accommodate 15 million passengers. JFKIAT LLC is owned by a joint venture including Schiphol USA Inc., a U.S. affiliate of Schiphol Group.